Yesterday late in the afternoon. .
my beloved and I decided to go out on a mission to spy see if Barnes and Noble is ready for the bunch of . .
Mennonite Girls Can Cook . . Guess what song kept floating through my head? I taught Grade 3 - 5 Sunday School for many years. The only difference. .there was only two of us yesterday but more will be coming on Saturday. I saw the sign. .
so I casually enquired about them. Yes. .they have 30 books in stock ..
so if you were hoping to get your copy in Bellingham B&N on Saturday. .
We'll be there at 10 ..
even though the sign says 11. We are very excited to be signing books in Ellen's home country. She has come to Canada so many times ..
we are thrilled to be signing with her in the US. after a quick bite to eat . .
we are crossing the border once more. .
and heading into Vancouver to the Ten Thousand Village store on Commercial Drive. We hope to be there by 4 pm. 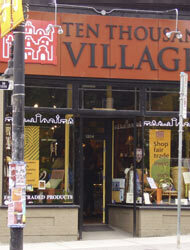 If we are a tad late. .
Saturday October 1st happens to be the 65th anniversary of Ten Thousand Villages and all their Canadian Stores are having special celebrations. Come early and browse around and we'll be so thrilled to meet you when we get into town. if you live in Manitoba. .
you can catch Betty and Charlotte at the Henderson Store between 11 and 1. We are most grateful for these opportunities. 100% of the royalties are going to feed hungry kids. Oh I'm so excited to see that sign. Can I steal it and share it on facebook and on my blog again for advertisement? See you soon! Found Waldo right away and now am wondering where the other 29 are. Have a blast, Ladies. It sounds like a fun and busy day! I know you'll have fun down there, and those 30 books will be gone in a minute! Hmm..bottom shelf huh? Have a fun signing time! How did you do that...did you do that yourself or ??? Only 30 books?? I hope you bring back ups as I'm sure you will sell many more! Enjoy your book signings!! I really miss Canada, and driving around and exploring. A really pretty place with wide open spaces. Richard from the Amish settlement of Lebanon,Pa. Yes...we will have fun tomorrow! My pen is ready...for signing those 30 books. It looks like a fun weekend is in store for the MGCC ladies. I'm sure those 30 books will be gone in no time. Earlier this week I made Judy's cauliflower cheese soup from the book and tonight I am making your cabbage rolls. Can't wait to try them as I remember my mom making them when I was growing up. I don't have her recipe, however. So glad to hear the the Mennonite Girls are coming to my city! (Vancouver) I plan to be there!! Here's to hoping you all sell hundreds of books, which helps such a worthy cause. They are will be blessed when they get to meet each of you. I know whereof I speak. I smile each time I pick up my copy of MGCC book. So happy for you!